Tehran has blocked a UK Foreign Office website in Iran as part of its "ever-tightening stranglehold of censorship", the foreign secretary has said. William Hague said UK for Iranians was launched on March 14 to "reach out" to its citizens but access from the country was blocked on March 17. 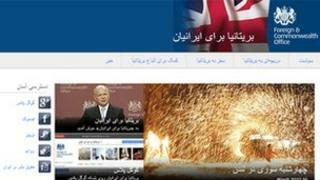 In December, Mr Hague said Iran had blocked access to the British embassy website for people in Iran. Britain last year closed its embassy in Tehran and expelled Iran's diplomats. It followed an attack on the embassy building, which Iran described "unacceptable behaviour by a small number of protesters". However, British diplomats said they believed it was likely the attack had state backing. In a statement on Sunday, Mr Hague said the UK for Iranians website had been established to explain UK policy and engage with Iranians and that the blocking of the site was "only a very small part of what Iranians endure daily". He said Iran's government had jammed international television channels, closed film and theatre productions, rewritten traditional Persian literature and banned the publication of some books and newspapers. "We have no quarrel with the Iranian people and regret that the Iranian authorities fear their own citizens' interaction and involvement with the outside world," Mr Hague said. "We will continue to look for opportunities to engage with the Iranian people, confident that Iranians are outward looking and deserve the same freedoms that others enjoy around the world." The UK, US and EU have imposed sanctions on Iran, accusing it of trying to develop nuclear weapons. Iran says its nuclear programme is peaceful.